H. Rick Bamman - hbamman@shawmedia.com Black Friday bargain hunters Armando Duenas (center) and his sons Luke (from left) and Jack and Mark wait for the doors to open at the Crystal Lake Best Buy. The Duenas family stood in line since 2 a.m. waiting for deal on a flat screen television. 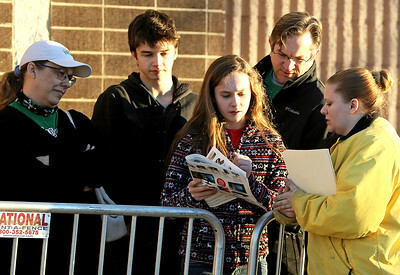 H. Rick Bamman - hbamman@shawmedia.com Best Buy employee Nichole Jankowicz (right) assists Black Friday customers waiting for the Crystal Lake store to open. H. Rick Bamman - hbamman@shawmedia.com Black Friday bargain hunters stream into the Crystal Lake Best Buy when the doors opened at 8 a.m. Friday, Nov. 24.2017. 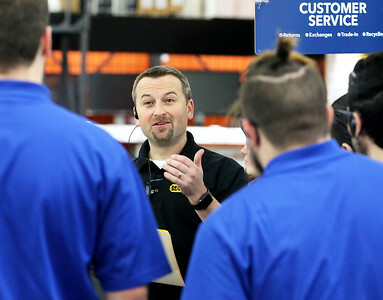 Some customers had waited in line since 2 a.m.
H. Rick Bamman - hbamman@shawmedia.com Crystal Lake Best Buy General Manager Jerry Tabor leads a team meeting before the opening of the store on Black Friday, Nov. 24, 2017. 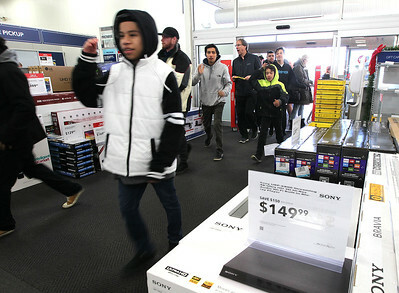 Black Friday bargain hunters Armando Duenas (center) and his sons Luke (from left) and Jack and Mark wait for the doors to open at the Crystal Lake Best Buy. The Duenas family stood in line since 2 a.m. waiting for deal on a flat screen television.